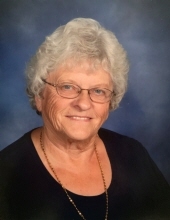 Carol E. Kelsey, 81, of Davis, IL peacefully passed away into her eternal home at 12:38 am Thursday April 4, 2019. She was born February 15, 1938 in Rockford, IL the daughter of Mr. and Mrs. Owen and Margaret (Leaf) Whisman. Carol graduated from Durand High School class of 1956 and Beauty School. She married Weyburn L. Kelsey in Durand, IL on September 14, 1958 and together they farmed all of their lives. She is a member of Faith Community Church. She enjoyed singing, dancing, crocheting, sewing, quilting, baking her famous chocolate chip cookies, spoiling her grandchildren and great grandchildren. Carol and Weyburn were snowbirds, in Florida, for many years. Survivors include: son Dale Kelsey; daughters Polly (Ray Hutchison) Kelsey, Becky (Ken) Brubaker, Jr.; son Mark (Stacey) Kelsey; 19 grandchildren, 20 great grandchildren with one on the way; sister Donna Getty; brother Gerald Whisman; several nieces and nephews. A funeral ceremony will be held at 10:00 am April 8, 2019 in Faith Community Church 212 West McKimmy Street Davis, IL with Pastor Bob Kolb officiating. Burial will be in Howard Union Cemetery. A visitation will be held at the Church from 3:00 pm to 6:00 pm Sunday. A memorial is being establish. To send flowers or a remembrance gift to the family of Carol E. Kelsey, please visit our Tribute Store. "Email Address" would like to share the life celebration of Carol E. Kelsey. Click on the "link" to go to share a favorite memory or leave a condolence message for the family.